No two commercial truck or passenger car accidents are the same. There are a number of factors and causes for an auto accident as well as a number of results that could affect both drivers involved. When you’ve been involved in an accident that results in personal injury, a totaled car, or even a death, you may not know where to turn or what steps to take to start receiving compensation for your losses. That’s where an accident lawyer in Peoria, Arizona, comes in. As varied as auto accidents are, the settlement results can be even more diverse. An experienced truck accident lawyer like Nathaniel B. Preston of Warnock MacKinlay Law, will be able to provide you with the valuable advice you need to ensure your voice is heard in court and you reach a fair settlement. How severe is a semi-truck or tractor trailer accident? According to the U.S. Department of Transportation, from 2014 to 2015, the number of trucking accidents resulting in fatalities has increased to over 4,000 a year. When they take non-fatal truck crashes into account, the number jumps to more than 400,000. Whether traveling on a rural road or between cities on a highway, car accidents are a common occurrence, but when a car crash or collision involves a semi-truck, then things can become even more dangerous. Due to the size and weight of semi-trucks and tractor-trailers, the injuries suffered as a result of a collision, crash, or accident can be life altering. Because of this, it’s important to take action as soon as possible to receive compensation for any resulting injuries or damages. Beyond personal injuries and damages to your car, you may be able to receive compensation for hospital bills, pain and suffering, or losses that incur from not being able to earn a steady income during recovery. To determine what type of compensation you may be eligible for, reach out to an Arizona truck accident lawyer following your collision. If you’ve been injured or lost a loved one as a result of a truck-related crash or collision, we can help you claim compensation for your losses. Mistakes happen on the road all of the time. However, there are federal rules and regulations put in place to ensure truck drivers don’t endanger others while sharing the road. Each individual driving a semi-truck or tractor trailer is responsible for following safe and responsible driving practices to prevent auto accidents. And if they’re affiliated with a company, then that company is also responsible for ensuring their drivers are safe, competent, and insured. One example of federal and company rules that help improve road safety is the log all truck drivers must keep in order to record their time spent on and off the road. There are federal guidelines that regulate how many hours a truck driver can be on the road before taking a break. Each driver is responsible for tracking these hours to ensure they’re complying with the law. Too often, these types of regulations are ignored in an effort to ensure fast and efficient delivery for a particular company. Even if it’s not encouraged by the company itself, a driver may be tempted to skip breaks to meet a deadline. That’s when a serious accident can happen. Driving with little or no sleep is already dangerous enough – but when navigating a vehicle as large as a semi-truck or tractor trailer, a resulting accident can be detrimental for all parties involved. Regardless of if it’s a clear day or there’s a terrible storm, speeding always increases the danger for everyone on the road. Even when driving under the speed limit, if the weather conditions are bad enough, a court could still find that a driver was driving with excessive speed for the conditions. Driving while sleep deprived endangers everyone in the area. Beyond the threat of falling asleep at the wheel, a driver who is fatigued cannot have the same reaction time as those who are wide awake and in their sleep-deprived state, may make a number of dangerous decisions while behind the wheel. Some truck drivers may turn to drugs or alcohol in search of reprieve from their busy lifestyle. Even so, driving any vehicle – commercial or personal – while intoxicated is both illegal and dangerous. When spending so many hours on the road, maintaining the brakes and tires for a commercial truck is imperative to ensure everyone’s safety. In the same thread, ensuring that the load is secure and that the truck is not overloaded is also critical to avoid an unfortunate accident. Even if you’re not driving a commercial truck for long distances at a time, you should still take steps to avoid accidents while on the road. Ensure your car is well-maintained and always obey your local Peoria, Arizona traffic laws. Drivers of passenger vehicles should also employ defensive driving techniques whenever they’re sharing the road with a semi truck or tractor trailer. Many trucks have signs to indicate where their blind spots are. Don’t linger alongside a truck when passing. Try your best to avoid being stuck in these areas. Pay attention to the truck’s turn signals. Follow safe and appropriate passing procedures. Don’t try to pass a truck on the right if they’re signalling they they are turning right, for example. Don’t cut off a truck – it’s a lot easier for your passenger car to slow down safely than a semi-truck. What happens if the truck driver was negligent? Drivers that have been in a truck accident in Peoria, AZ, may be entitled to compensation depending on the circumstances. If the driver involved is guilty of any of the dangerous driving practices mentioned above, then you may be able to receive compensation or reimbursement for your medical expenses, lost wages, property damage, or pain and suffering. The first step would be to prove that the truck driver’s negligence is what resulted in the accident. For example, if the driver was under the influence, had not logged any recent hours showing they took their federal-mandated breaks, or they were using their cell phone at the time, then you can show the court that he neglected his duty to drive safely. If you suffered injuries as a result of the crash and you’re seeking compensation for medical expenses or lost wages because you couldn’t work at the time, you’ll also need to prove the the court that your damages were suffered as a result of the truck driver’s negligence or misconduct. In short, truck accident claims are complex, and it takes a skilled attorney to ensure you aren’t held financially responsible for someone else’s mistake. Let Nathaniel B. Preston of Warnock MacKinlay Law walk you through the process of getting the compensation you deserve. As your personal injury lawyer, Nathaniel can advise you on the best steps to take to ensure a positive result for your case. The moments following a commercial truck collision can be terrifying. You may be unsure of who to turn to next. Fortunately, there are steps you can take to not only protect yourself and other drivers on the road, but they can also help build your case against the truck driver who caused the accident. Just because you’re awake and alert doesn’t mean that you haven’t’ suffered any medical injuries following your truck accident. This is why the first thing you should do is call 911 to ensure the police, EMTs, and paramedics can come to the scene as soon as possible to assess your injuries at the scene. In addition, the police will then create an official record of the accident based on the information you and the truck driver provide about the incident. This record can then be used as evidence that backs up your claim in a future court case. 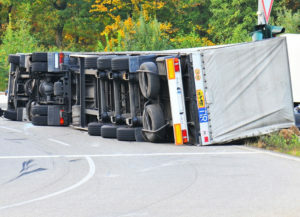 If possible, you should also document the truck accident for your own personal records using your phone or another device to record a statement. It should include as much detail as possible about the accident itself and the aftermath. If you’ve sustained injuries following an accident, or your property has been damaged, then a truck accident attorney can help you recover damages. Contact attorney Nathaniel B. Preston of Peoria, Arizona, for a truck accident consultation today to discuss the details of your case. You may wonder why this step comes after contacting your Arizona personal injury attorney. That’s because your insurance company may ask questions that could be used against you during the legal proceedings of your case. Due to this, it’s important to have an attorney answer these questions on your behalf for your peace of mind. When the average passenger car driver is affected by a semi truck crash, they are usually the ones who must face the financial damage in the aftermath. Due to the sheer size of a commercial truck, their vehicles can cause massive damage to a passenger car, resulting in an increased likelihood of property damage and personal injury for the driver in the smaller car. You have the right to request compensation or reimbursement for the time and money you lose after the accident – especially if the truck driver is at fault. If you or a loved one has suffered losses or personal injuries following a truck collision, then you don’t have to face the courts alone. A skilled attorney will know what the court expects and needs to hear before awarding you compensation. They’ll use this information to thoroughly investigate your accident and identify who is liable for the resulting damages. This investigation will also include researching the truck driver involved to see if they partook in any questionable behavior within 24 hours of the accident, or if they neglected to follow the safe driving rules set by the government or their company. While the truck driver may have a company, attorney, and insurance company all backing him or her during the case, with an experienced personal injury lawyer on your side, you’ll be able to negotiate a fair settlement for your expenses and damages. Your attorney will help you receive the compensation needed to take care of your medical expenses and replace loss income so you can start to move forward from this difficult time in your life. To find out what your truck accident claim may be worth, reach out to attorney Nathaniel B. Preston to discuss the details of your case. No one is able to fully account for the extent that a truck accident can affect their lives – especially when the case is brand new. Because of this, accident injury attorneys don’t advise their clients to rush into a settlement to ensure they are compensated for their total losses to avoid any future problems that could arise down the road. While we understand that you want to put this accident behind you as soon as possible, don’t make the mistake of settling too early just because you’re being pressured by the truck driver’s insurance company or place of business. Hire a professional truck accident attorney today to learn about your options for total compensation. Let an experienced attorney help you get the maximum worth for your truck accident case in Peoria, Arizona. Nathaniel B. Preston of Warnock MacKinlay Law understands that truck accident claims can get complex. If the responsible party does not admit fault, it can become difficult to prove who is liable for the accident. That’s where a lawyer can help. From the very start, your attorney can investigate or recreate the incident and research the driver involved in order to find evidence that strengthens your lawsuit. And with Nathaniel B. Preston, you don’t have to pay anything for your initial case evaluation or your attorney’s fees unless he recovers your money first. Our number is 602-652-2009.